The game repeats itself every year. Marketing executives are getting nervous about the upcoming main shopping season. 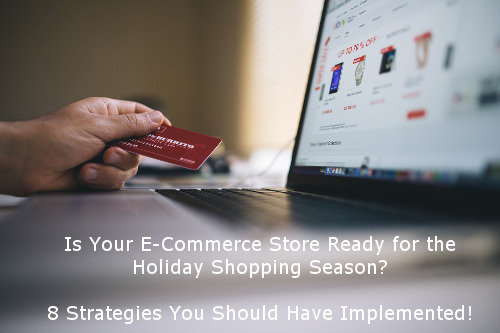 Last year I provided some tips on how you can prepare your web-shop for holiday shoppers. Let me do this, again. Since I do not know details about your business, I can only share some general strategic advice with you. But it's really kind of scary. Far too many e-commerce stores provide a poor user experience and lack of functionality. There is a lot of money being left on the table. But you can avoid this altogether in your own business. Immediately send a follow up email sequence. Offer discounts and coupons in exchange for email signups. Provide valuable insights in your emails that they couldn’t get elsewhere. For example, if you sell coffee products, provide people with tips for making the best cup of coffee. Offer a rewards program for those who sign up. First, many times customers aren’t aware that you offer better options. Second, customers may not understand why they need the upgrade. Ask those who have purchased to post pictures of themselves using your product on Instagram. Develop a unique hashtag around your product that users can share. Run contests where you give away products. Consider giving away products to influencers in exchange for them posting photos. Engage with your customers in the comments section of photos. This ties in closely to abandoned carts. There will be many times when a customer simply wants to mark an item for the future, rather than purchase it in the moment. Once people begin adding items to their wishlists, you can periodically remind them of these items through email or Facebook retargeting ads. Wishlists also let you cross sell more effectively. When you know what your customers want, you can promote other closely related items. Write clear, compelling product descriptions. Include the design specifications, but don’t go on endlessly about them. Rather, focus on the benefits of the product. Include easy to see, zoomable, professional photos. If your pictures are grainy or look like they were taken in a garage, people won’t want to purchase. Make your site simple to navigate. Clearly divide products into the proper categories and subcategories and make your menus simple to use. If possible, include product demonstration videos. A simple way to generate product reviews is to send a follow up email several weeks after a purchase asking the customer to review the product. If they have a complaint about the product, you can address it then as well. eCommerce shouldn’t be complicated. Yes, it’s hard work. Yes, you need to put in the time. But if you know what to do, you can find success. The most successful eCommerce companies have won because they’ve persisted. They’ve determined what works and what doesn’t. Don’t give up. Stick to the formula. This info should not be new for you, if you are in the e-commerce business for some time. But I bet, you have not implemented all of these 8 ideas. Source: 8 Powerful Ecommerce Marketing Strategies To Boost Your Sales (↑) written by John Hawthorne, Jun 30, 2017. Original site deleted. Lookup via Wayback Machine in April 2019. Posted by John W. Furst in Advertising, Business Strategy, Marketing, Usability on Tuesday, August 15, 2017 has got 5 Comments. Thanks. I switched to Magento this year. Life is easier now. Hi, just wanted to share with you that we had a great vacation at Marina de Bolnuevo in July of this year. We flew into Alicante and hired a car from the airport for the short drive to Bolnuevo. The beaches are superb, most of them awarded the Blue Flag. The cafes were great, with paella on the beach a must and managed a day on the nudist beach there. Very liberating. We also visited the Big Guns, The Roman Mines and the Sand sculptures. Will be returning there again in 2018. Thanks for reading Niall. Your response is not on topic at all. This time I let it through, because this seems to be a nice place. Yep, Black Friday is coming soon.